MANCHESTER, England (AP) — Manchester United ended a four-match Premier League winless run as Jose Mourinho’s sixth-place team eased to a 4-1 victory over rock-bottom Fulham in the Premier League on Saturday. Ashley Young struck into the top corner to put United ahead in the 13th minute, Juan Mata coolly slotted in the second from Marcus Rashford’s cutback in the 28th and Romelu Lukaku ended his 997-minute wait for a goal at Old Trafford in the 42nd. 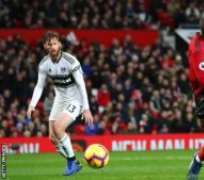 Substitute Aboubakar Kamara’s penalty reduced the deficit from the spot but Fulham midfielder Andre-Frank Zambo Anguissa’s sending off in the 68th was followed by Marcus Rashford netting for United in the 82nd. It was a promising response by United to recent setbacks, with Paul Pogba remaining on the bench despite Jose Mourinho making four changes.